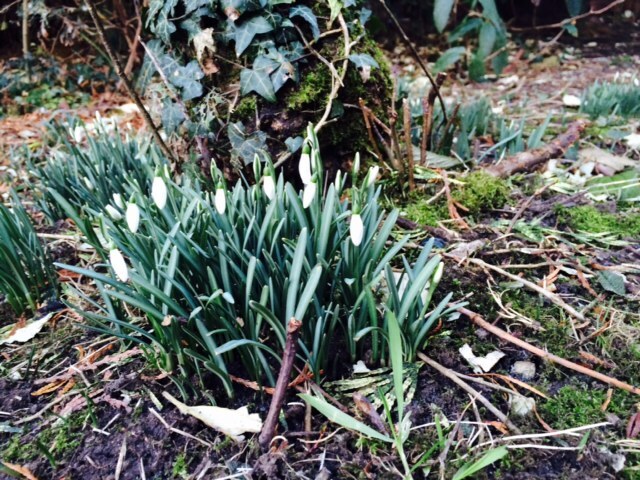 I was walking along a footpath on my way to our local surgery the other day and noticed some little green shoots – snowdrops making their welcome appearance after all the recent snow, ice and cold weather. I always find them such a hopeful sign that Spring isn’t so very far away now, a reminder of gentle, changes occurring naturally. White flowers making their way towards the daylight, long before we might have noticed any shift in the season. I have loved NLP for a long time – but it is still possible to be reminded of how helpful and life affirming the simplest of tools can be. I was facing a challenge recently and I reached for the simplest tool in the NLP book: the Present State, Desired State model. In a nutshell this model gets us to explore – ‘Where are we now?’ And then in lots more detail and richness, ‘Where do we want to be instead?’ There may well be things that we cannot change about a situation however we can think about it differently…. “Supposing I woke up one day and it was fixed … what would that be like”? What will I see and hear now it’s fixed? What is happening? How do I feel about this now? How is my thinking different? What am I enjoying most in my life now? What is important about having made this change? What else becomes possible as a result? As I begin to really explore these questions in a rich sensory way – my state begins to shift, I start to relax and feel more positive and in control. The issue seems like a much smaller part of the picture, not the whole. My thoughts are filled with more colour and vibrancy and a sense of calm and normality returns. In this state of mind – my body feels more relaxed and at ease and I can trust I’ll make the best choices available. Gentle, positive changes, happening naturally. We wish you every success and happiness as you grow in 2015!